Rooibos, (pronounced royboss), latin Aspalathus Linearis is South African for ‘redbush’ and is only Grown high in the mountains of South Africa, in unpolluted surroundings. Rooibos is extraordinarily rich in naturally occurring nutrients. At a particular point in the plant's ripening process, the leaves develop a reddish-brown colour giving its name Redbush tea. Relatively new to North Americans, the properties of Rooibos tea have been scientifically documented in Japan and South Africa. Their studies show that Rooibos tea relieves insomnia, nervous tension, mild depression, stomach cramps (including colic), constipation, and allergic symptoms (even those caused by hay fever and asthma). It can also ease itching and skin irritations, thereby also offering eczema and acne victims welcome deliverance from misery. -Minerals in Rooibos tea include iron, potassium, calcium, copper, zinc, magnesium, fluoride, manganese, and sodium. 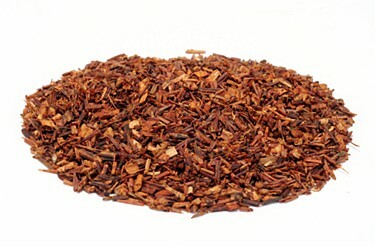 -The anti-spasmodic properties of Rooibos relieve digestive distress in adults, colic in infants. -As a true adaptogen (helping the body adapt to stress), Rooibos tea will refresh you during the day and relax you at bedtime. -Rooibos contains alpha-hydroxy acid, known to promote healthy skin. -Potent anti-mutagenic components in Rooibos are conjectured to be responsible for inhibiting chromosomal breakdown.